Lal Bahadur Shastri 2 October 1904 11 January 1966 Indian Sharada Prasad Srivastava Ramdulari Devi Politician, Social Activist The P.M of the Republic of India and a leader of the Indian National Congress party. He joined the Indian independence movement in the 1920s. He was the first person to be posthumously awarded the "Bharat Ratna". 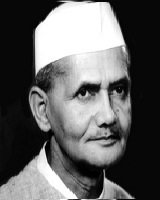 A list of popular Hindi Lal Bahadur Shastri quotes are given below.